The process of online train ticket booking should be as fast as possible. This will increase the chances of getting the confirmed ticket. Using master list, travel lists, and favourite journey lists, we can quickly fill the required information during online ticket booking. This will save precious time, especially for TATKAL booking, where every second is important. To create above lists, login to IRCTC website by entering your user ID and password on the login page of IRCTC, as shown below. 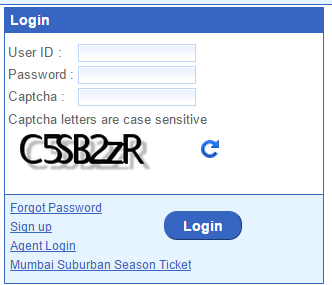 Please note that captcha letters are case sensitive. 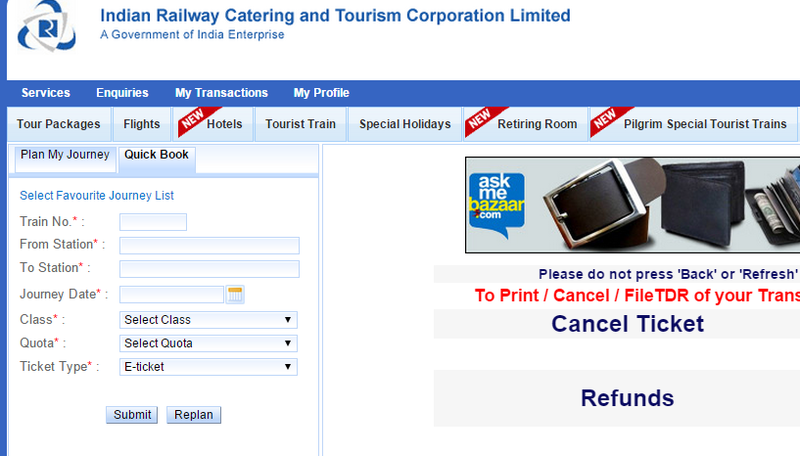 You must be careful about small and capital letters, as well as difference between numbers and letters, such as 5 and s.
After you login to IRCTC, the following web page is shown. The above web page is showing "My Profile" button on the top ribbon. If you bring the cursor on it, then a drop down list is shown. The list contains various options which are explained below. Update Profile: Select this option if you want to change your personal information such as mobile number, email ID, address etc. Master List: Select this option to prepare a list of all the passengers who generally travel together. After you select Master List, a portion of screen that appears is shown below. Fill the names (maximum 60 characters), date of birth, gender, Berth preference (LOWER, MIDDLE, UPPER, SIDE LOWER, SIDE MIDDLE, SIDE UPPER, WINDOW SIDE, CABIN, COUPE), food preference, senior category concession, card type (Driving Licence, Passport, PAN Card, Voter ID-Card, Govt Issued ID-Card, Student ID-Card, Bank Passbook, Credit Card With Photo, Aadhaar ID), and card number for every passenger. 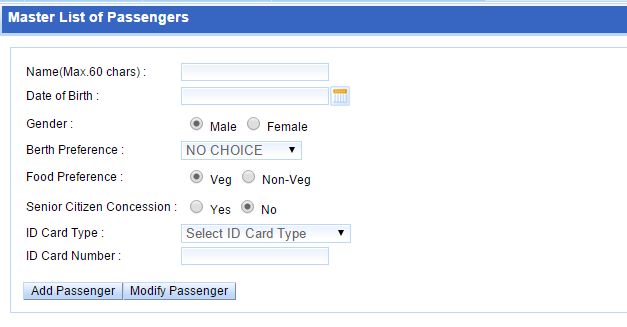 After filling the required informations, click "Add Passenger" button. Add all the passengers in the same way. 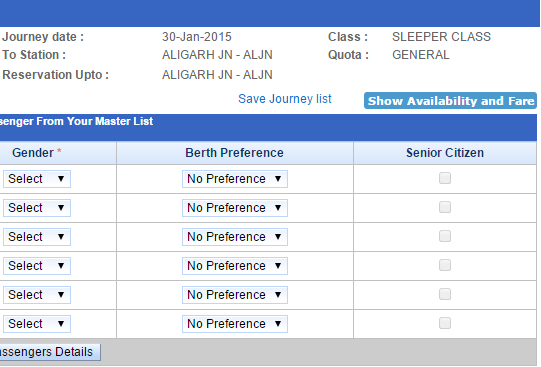 Travel List: Select this option to prepare a list of passengers from Master List for whom the reservation is to be done. Give a proper name to this list. After you select Travel List, a portion of screen that appears is shown below. Give a suitable name to the travel list, which could be name of starting station to the destination station. Under description of the travel list, you can indicate short name of passengers on that list. Check the box corresponding the name of the passengers to whom you want to be on a particular travel list. Using travel list, you can quickly fill the names and other details of the passengers in the online reservation form of IRCTC who are travelling together on a particular journey. 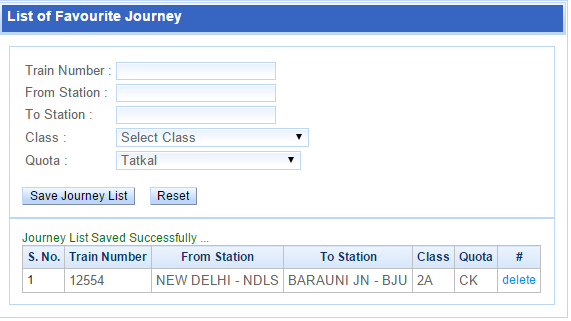 Favourite Journey List: Select this option to prepare a list which contains the information about train number, starting station, destination station, journey class, quota, etc. After you select Favourite Journey List, a portion of screen that appears is shown below. After filling in the information, click "Save Journey List" to save the list. After that, a portion of screen that appears is shown below. This list can also be prepared after you have filled in desired information under "Quick Book" option. After filling the desired information, click "Submit" button. The following diagram shows a small portion of the screen that appears. Enter the required information for each passenger and click "Save Journey List" to save the travel list. By selecting "Favourite Journey List", you can quickly fill the train number, starting station, destination station, journey class, quota for a particular journey for which you want to book the tickets. Please note that "Quick Book" service is not available between 08.00 a.m. to 12.00 p.m. However, you can still use "Favourite Journey List", "Master List", and "Travel List" facilities. Now whenever you want to book a ticket, you don't have to fill the details of the train number, starting station, destination station, journey class, quota and passenger details separately. Just select the relevant "Favourite Journey List" to fill the details about the journey and relevant "Travel List" to fill the details of the passengers. This exercise will save a lot of time while entering journey and passenger information while booking a ticket, especially for a TATKAL ticket where every second counts. Half tickets for children below 12 years can be booked but no berth will be provided. If berth is needed, full ticket has to be purchased. 2 lowr births or atleast one lower birth. Thanking you. 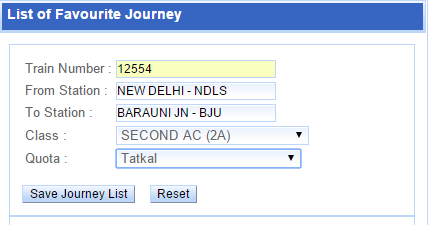 i have saved the journey details in irctc web. Getting this error While saving the journey detail. Getting this Message while saving the favorite journey Unable to Process Your Request.